Tej Pratap had announced his resignation as the patron of the Rashtriya Janata Dal's student wing after being sidelined by his family and the party. 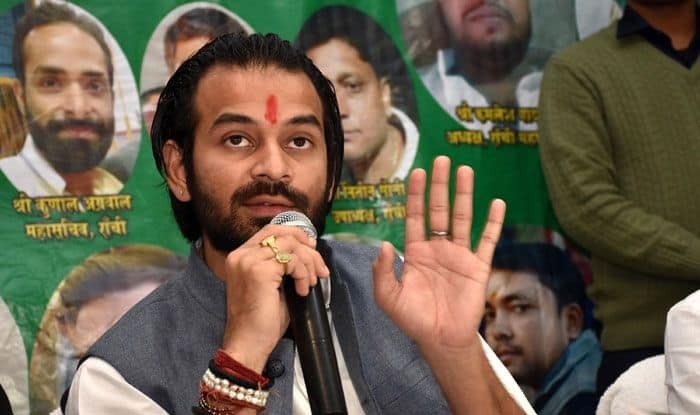 Tej Pratap Yadav, the elder son of former Bihar Chief Minister Lalu Prasad, is likely to contest the Lok Sabha polls against the father of his estranged wife and RJD candidate Chandrika Rai from the Saran seat. The development comes a day after Tej Pratap Yadav announced that he had resigned as the patron of the Rashtriya Janata Dal’s student wing after being sidelined by his family and the Rashtriya Janata Dal (RJD). Party sources said on Friday that Tej Pratap Yadav was angry that his younger brother and Leader of Opposition Tejashwi Yadav had named Rai as the RJD nominee from Saran, a seat which was won by their father Lalu Prasad four times. “Tej Pratap felt insulted and humiliated over the party’s decision to field Rai from Saran. He will contest the polls against him as an Independent candidate,” a party leader said. Tej Pratap Yadav is yet to make an official announcement. In November, he filed a petition in a court seeking divorce from his newly-wed wife Aishwarya Rai. Despite pressure from his family, he refused to withdraw the plea. Aishwarya is Chandrika Rai’s daughter and granddaughter of former Chief Minister Daroga Rai.